In Fortnite on Switch, jump in to be the last one standing in a high-stakes game of 100-player Battle Royale. Build huge forts. Outwit your opponents. Earn your Victory Royale. Squad up together online with friends in the same room or around the world. 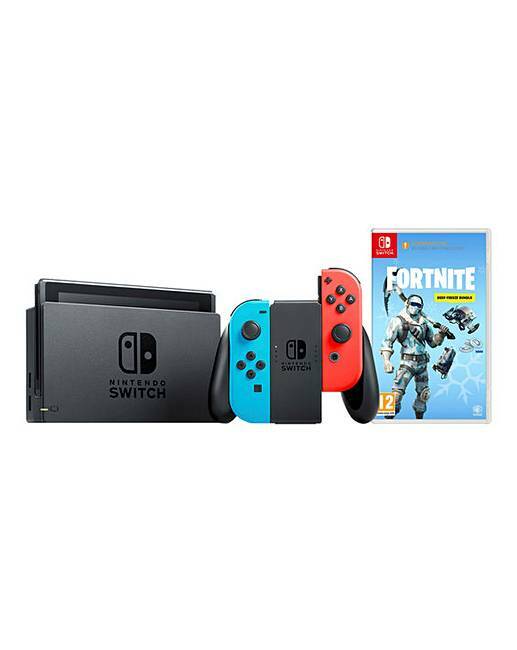 Enjoy a flexible gaming experience on one of the most innovative consoles with the Neon Red/Neon Blue Nintendo Switch. This powerful device not only connects to your TV but can also be transformed into a handheld device so you can enjoy your favourite games on-the-go. Play the Nintendo Switch on your TV by slotting the tablet into the docking station and watch your games come to life on the big screen. Invite your friends over for a fun multiplayer battle, or go solo in single player mode - it's all possible with the Neon Red/Neon Blue Nintendo Switch. The powerful 6.2-inch screen enhances your gaming experience no matter where you are. The bright HD graphics can help bring any game to life when playing as a handheld device. Whether you're on the bus, in the park or in your living room, the Neon Red/Neon Blue Nintendo Switch is perfect for all. The detachable Joy-Con controllers are a matte Neon Red and Neon Blue so you can game in style. With a variety of playing styles, you're free and flexible to play the Nintendo Switch as you wish.